In honor of our Ecuadorian brothers and sisters, I have decided to share this simple but delicious recipe that can be served as a side dish with any baked or grilled fish recipe. 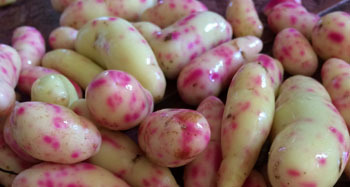 It’s a classic Ecuadorian side dish made with a tuber known as “Melloco”, a potato variety similar to our fingerling potatoes that are known to contain high levels of protein, calcium, and carotene. You can use Fingerling Potatoes instead of the original “Melloco” since I’m pretty sure it must be difficult to find in South Florida. Chose this lean potato recipe instead of the regular french fries for less fat and don’t forget to put your grain of rice (or Quinoa) in the aid of the people of Ecuador. Follow this CNN link and find out how you can help the people in Ecuador now! Boil the potatoes until you can cut them with a fork(make sure you don’t over cook them) about 10- 15 minutes. Toss with oil, lime juice and scallions and season with salt and pepper to taste.